The Rebel Sweetheart. : Success Secrets for Makeup Artists. In case you’ve missed it, makeup artists work in competitive fields - film, TV, beauty, and fashion, to name a few. But, a handful of professionals know how to stand out from the competition regardless of where they work. Here, we share three ways you can set yourself apart from the crowd and succeed in the rough world of makeup artistry. This advice might be targeted towards recent graduates of makeup school, but it’s still important knowledge for all makeup artists. Before you can shine in any field learn all you can about who you will be working for. Makeup artists might work for ad agencies, art directors, or photographers. Discover what each type of employer is looking for and why. The more you know about your boss and how they hire makeup artists the better your chances of landing the job you want. It’s not enough to graduate from makeup academy. To truly excel in your field, it’s important to become highly skilled in your trade. This means hours and hours of practice. Whether you work at a department store or as an independent makeup artist, it’s important to practice the basics as well as the latest techniques as often as possible. Then, don’t stop practicing. The most successful makeup artists can do more than makeup. They also know how to style hair and wardrobe. While pursuing your education in makeup or after you’ve graduated, consider taking basic courses in hair and wardrobe styling to boost your skill set and make you more valuable to employers. 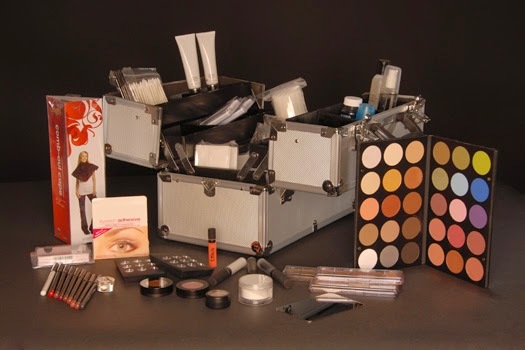 Cosmix School of Makeup Artistry is one of the top schools for makeup artists in the nation. The school provides comprehensive programs in fashion, beauty, and special effects makeup. Written by Cosmix School of Makeup Artistry. I always say that practice makes perfect. These are all great tips. I'm sure it takes a lot of knowledge that I just don't have as a user of make-up. Interesting advice. I don't wear much myself. I would image that it is very competitive in the entertainment industry to get a job in the make up department. These are excellent tips. These are great tips. I'm always amazed at what makeup artists can do.